My boyfriend forwarded me an article on Gizmodo presenting Prada's new 2012 Spring shoe collection, inspired by Classic American cars. The shoes have a fierce look to them, with old fashioned tail lights on the heels. For a moment, it almost looked to me like a lipstick was coming out the back of the heel, but I got what they were going for. Now, some people probably think these are just a little 'out there', and I won't be buying a pair for myself, but I considered how I would style them if I did. For a hot, sleek look, I would wear them with a pair of black skinny trousers, a fitted blazer, and a slightly oversized t-shirt. A tight ponytail keeps the look refined, while red lipstick adds to the fierceness of the auto-inspired heels. Is it coincidence that I picked driving gloves for a post on auto-inspired shoes? It was completely subconscious...but fitting, no? Throw on some shades to seal the deal! I actually really like this look, now. 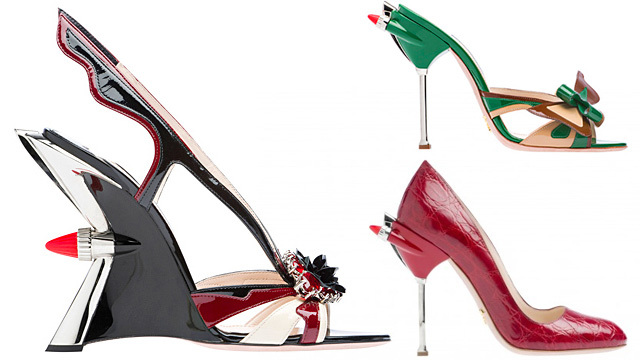 Maybe I wouldn't mind a pair of these Prada inventions after all. Hopefully my dad, being a car fanatic, would be more understanding of me splurging on these hot rod heels?? What do you think; just plain strange or a bold new shoe? Would you wear them? They'd be sure to make a statement either way!